I am really excited because we dug these little potatoes off our back yard! I cannot hold my contentment inside me. I have not heard of many who does not like potatoes. And anything that is harvested from the backyard is special; we all fought over to have an equal share. Since we had only a very few, just enough for a couple of bites for all of us, I decided to make something really easy and simple. This way the dish is not overloaded with other flavors but we actually get the taste and feel of our precious potatoes. It is going to be a short post today. My dad is here to visit us from India. I do not have words to tell you how awesome that feels. The kids are having a gala time and he has also taken over my backyard gardening… well sort of. A lot of things are brewing and growing in the yard and hopefully in a couple of months I will have a lot to share! Fingers crossed. 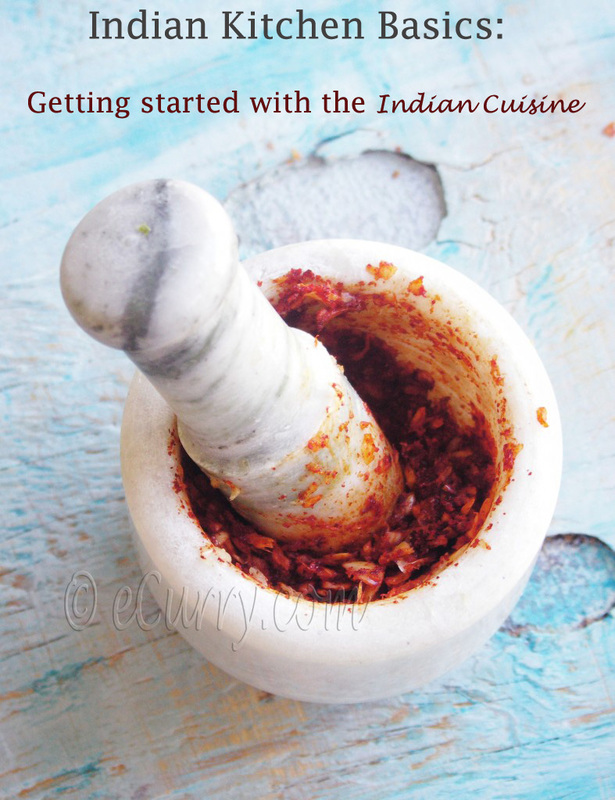 I have used a spice with very unique flavors to season the potatoes; ajwain/carom seeds have a sharp taste and are used in very little amount. They are extremely good for digestion too. Back in India the seeds are usually toasted and a pinch of the seeds are consumed after meal. 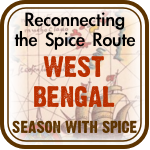 As you will see here, there need not be any fixed spice(s) for this recipe. Please use whatever you wish to. Note: Please do not limit yourself to the spices mentioned above. As you would have realized, this is a versatile recipe and and any spices or no spices may be used. Wash the potatoes well. Peel the skin if you wish. I do not peel the red potatoes and this time the potatoes were from my yard, so more reason to leave the tender skin on. Boil the potatoes (do not slice them) in salted water until just about fork tender. They should not be too soft and should not fall apart. Heat 1 tablespoon oil in a pan large enough to hold the potatoes in one layer. Add the ajwain/carom seeds. When the seeds sizzle and get fragrant, place the potatoes in the pan in a single layer. Reduce the heat, and carefully flatten the potatoes with the back of the spoon. It would look better if all the potatoes were just rightly flattened and not falling apart. Mine today does not quite show as the crash potatoes as some of them were really tiny and it was a bunch of mixed sizes. In a small bowl combine the salt (the Chaat Masala already has some salt, to adjust to taste), chili powder, red chili flakes, turmeric and Chaat Masala. Drizzle the rest of the oil, and half the spices that you have combined over the flattened potatoes. Cook for about 2 minutes and carefully flip them over. Now sprinkle the rest of the spices over the potatoes and cook for another 2-4 minutes or until the potatoes slightly brown and crisp. Adjust cooking time to the desired crispiness. After draining and completely cooling the potatoes, place them on a baking tray in a single layer. 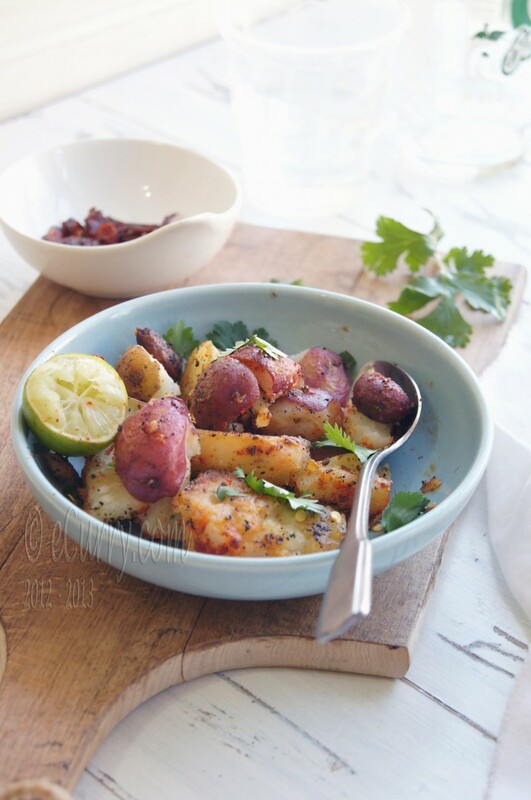 Drizzle the oil and sprinkle the spice mix (toast the carom seeds lightly, gently crush them and mix them in with the other spices) over the potatoes. Swirl the tray making sure some of the oil goes under the potatoes in the tray. Heat oven to 400 F, and place the tray in and bake for about 20 – 25 minutes, (or more or less until you get the desired crispiness and color.. ). The time will vary with kind and size of potatoes and also the over, so please adjust. Remove from pan and garnish with fresh herbs. Drizzle lemon juice. Serve hot. April 25th, 2012 | Category: Dry Fries, Grilled and Quick Cooked, Sides & etc. 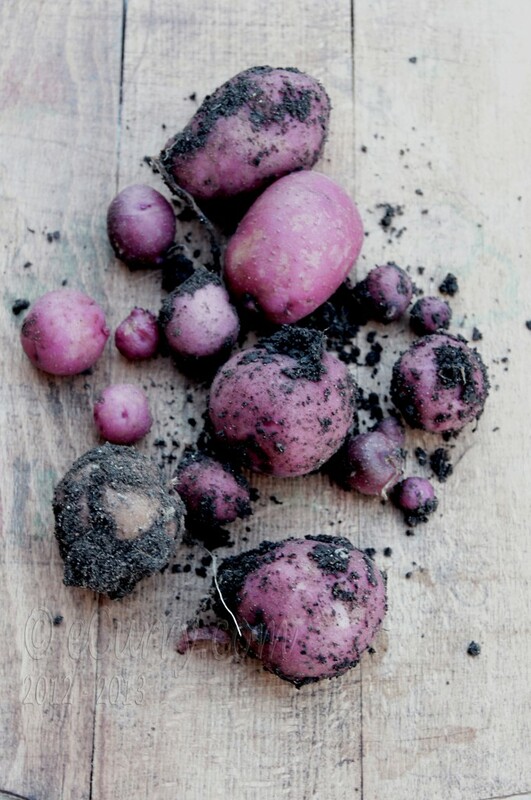 Oh gracious … from your backyard, that is fabulous and only adds glory to these gorgeous potatoes. Yes, I am a potato freak but I can only dream of growing potatoes in my backyard. You are one lucky girl to have baby potatoes from your garden! They must be so tasty. 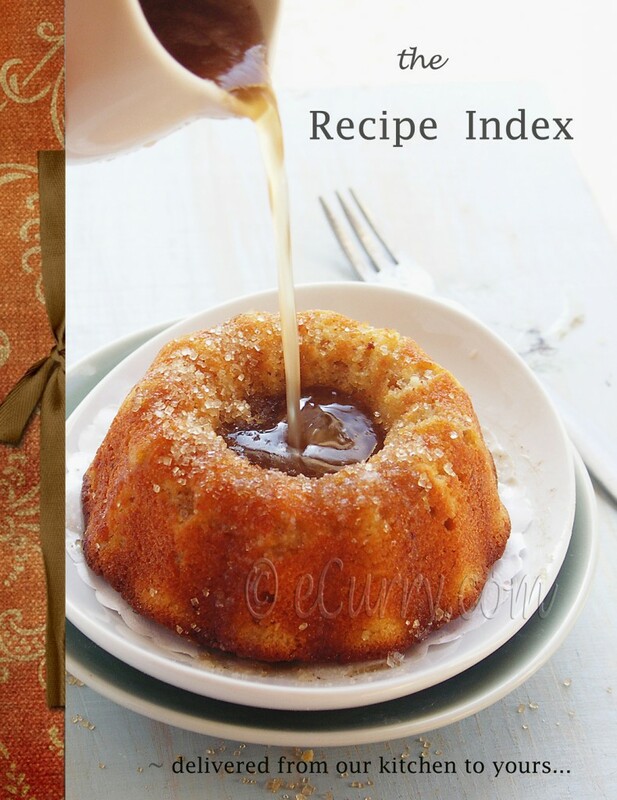 I love the recipe in it’s simplicity. Good quality vegetables need less complicated cooking. Oops, and I forgot to say: you must be happy having your dad around! Enjoy the precious time with your father Soma. I can imagine how happy you must be…the potatoes look so different from the usual ones. Potatoes in your backyard, you are lucky enuf to enjoy these. 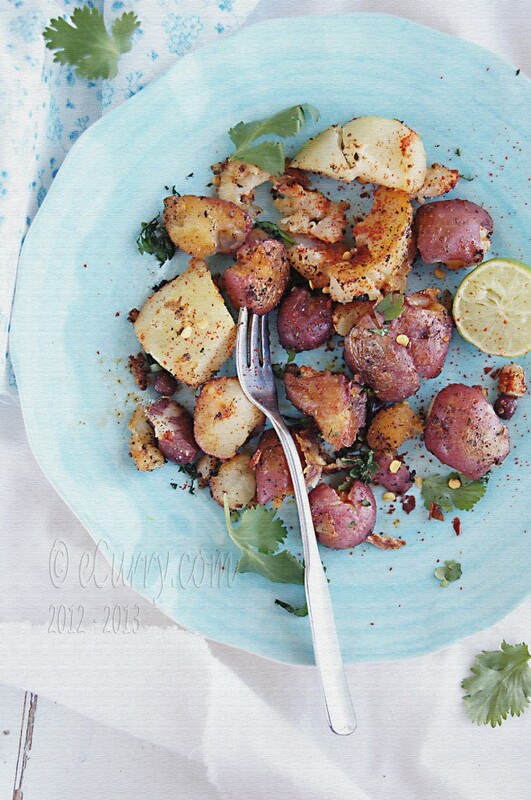 new born potatoes with chaat masala perhaps the best way to enjoy these. Enjoy your days with ur father. Looks delicious Soma, I came close to making the Pav bajji Masala and I am confident enough to post it, I shall update if I make any changes later. Did you get a chance to try it? I did not see any updates on FB after you set up the challenge. Let me know. I haven’t got a chance to even start trying it! 🙁 No there have been no updates in FB and I think you would be the first one to do it!! Will wait for it. It must feel so amazing to dig fresh potatoes out of your own backyard! Really exiting 🙂 Beautiful photos and the potatoes look so good. 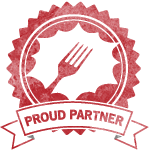 I found your site through food gawker…and i fell in love with your aqua plates! i love collecting plates like these (are they ceramic? porcelain?) do you mind me asking where you found this? your photographs are beautiful, by the way! love it! Thank you. It is a very plain plastic plate, the kind to use for the backyard parties and I fell in love with it too! 🙂 I found it in Kroger (grocery store) and they had it during Easter. I really regret that I did not get the other colors.. they had it in beautiful pastel shades. I went back the next day but they were all gone! How lucky to cook fresh veggies from your backyard..love the colors and click! Have a wonderful visit with your father! Thanks for this great recipe ~ they look delicious. Small red potatoes are the only ones I buy and never peel mine either ~ too many nutrients in those skins to throw them away! Thank you for all your hard work in maintaining a blog and sharing with us! What a wonderful post! must be such a lovely feeling to have fresh veggies growing right in your back yard! Lovely lil baby potatoes from your garden, must feel so good to harvest your own produce! 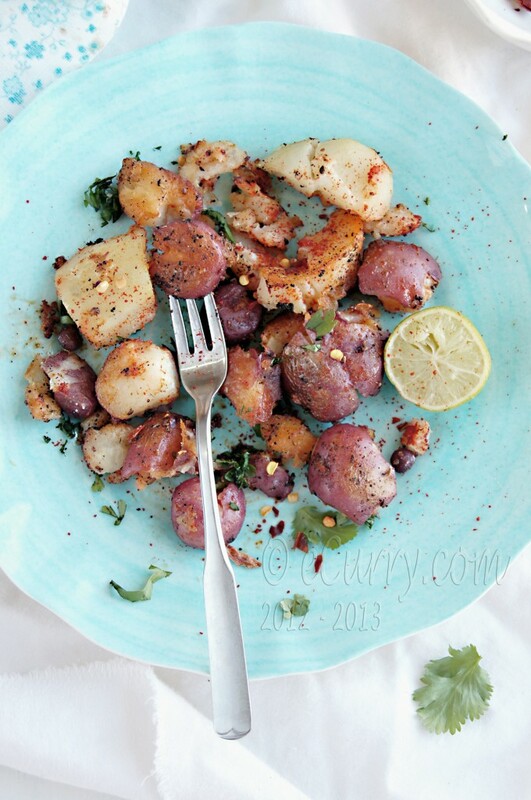 I loved how you spiced the potatoes, right up my alley..spicy & tangy! Soma, just posted the masala. please do provide your valuable comments. wow. lovely pics, it looks so gorgeous. U r one lucky girl, potatoes from your own garden 🙂 must be extra tasty….& your Dad also must be feeling proud of U….have fun time with your Dad….potatoes look yummy….I almost make similar kind but lazy me make it in the toaster oven(posted it last year), ….as kids love it so much, it’s almost daily affair..
What a beautiful post! And lucky you to have home grown potatoes, so exciting! Gorgeous pics, they look like spring! Nothing like own harvest products..looks great! You’re so right about anything harvested from the backyard being special. It’s wonderful to eat the food we grow ourselves isn’t it? 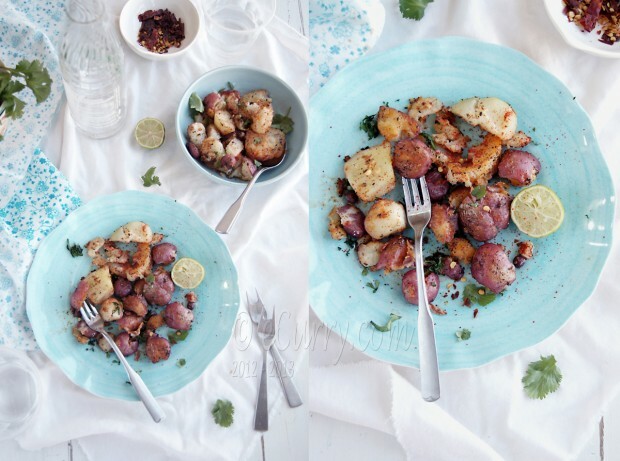 I love potatoes any which way… simple and delicious. 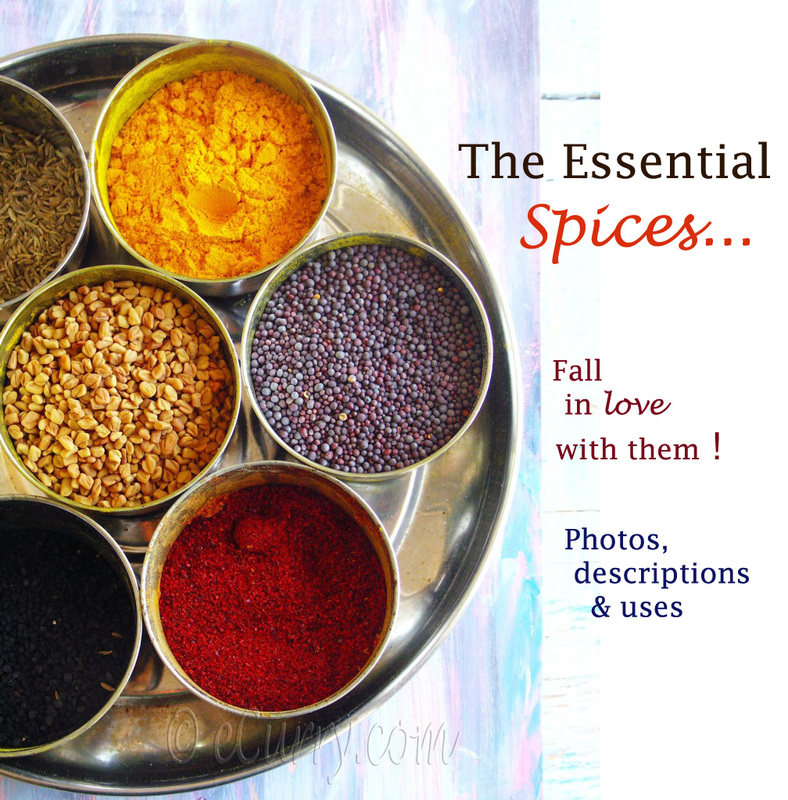 love the ajwain in there! Oh my.. the plate is sooooooooooo pretty.. the pic is soooooooooo gorgeous!! Lovely! 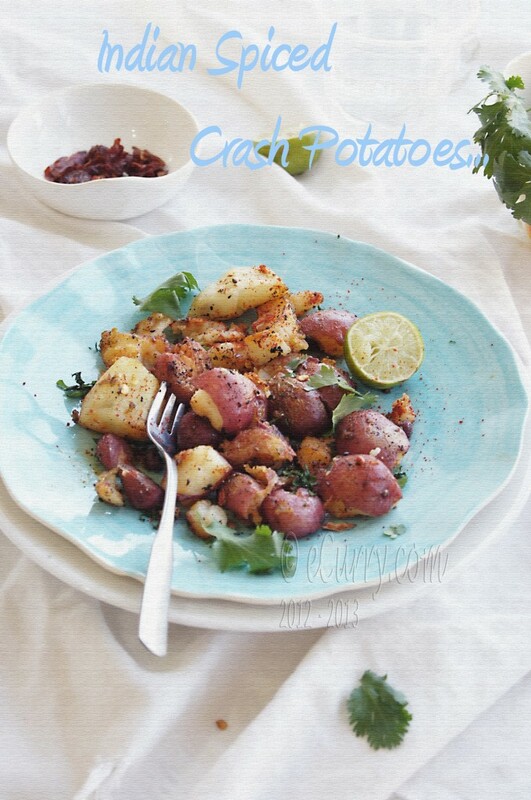 I love potatoes.. You jus gave another recipe idea !! thanks for sharing.. looks yummy !! Wow..It must have felt amazing growing your own..wonderful clicks..